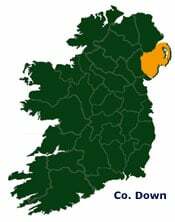 The hugely varied natural environment of the Kingdoms of Down stretches fifty miles from the Mournes to the shores of the Irish Sea at Bangor and west to the Lagan Valley. Within this space lie mountains and the rugged hills of Slieve Croob, the famous drumlin hillocks and the wide, sandy beaches of the coast. Among these lands you will find forest parks, and riverside walks where you can indulge in nature’s most abundant treasures. A walk into the Mournes can help you uncover the source of Northern Ireland’s longest river, the Bann, but you might prefer to find out what your handicap is at any of the 20 top class golf clubs instead. Get ready in the evening to put your feet up in a cozy country pub after a day of breathing in some of the freshest air in Ireland.